Unlike apps and wearable devices that require you to manually log the calories you consume, only GoBe™ 2 gives you automatic calorie management with Healbe FLOW™ Technology, the patented innovation that combines information from 5 sensors (impedance sensor, piezo sensor, galvanic skin response sensor, accelerometer, gyroscope) with an advanced algorithm to deliver comprehensive insights into whole-body health. Only FLOW Technology uses readings from an impedance sensor, taken several times per minute, to measure dynamics of liquid in an extracellular liquid which is bound to entering of a glucose, throughout the day. GoBe measures these changes by sending high and low-frequency signals through your tissue to determine the fluid volume of your cells. Healbe FLOW Technology uses this information about your cell’s changing glucose concentrations to measure calorie intake. Error-prone guesswork, different information on food product labels, the time-consuming process of manually logging what you eat and individual characteristics of your digestion system – all impede your motivation and fitness results. FLOW Technology uses your own body data to measure your physiological process, rather than a “standard” mathematical model, and effortlessly delivers this important and personalized information to your smartphone. GoBe 2 uses FLOW Technology to help you monitor a wide range of your body’s parameters, including calories consumed, calories burned, activity level (distance traveled/steps taken), heart rate/blood pressure, hydration level, stress level/emotional state, and quality of sleep. This information is meant to help you stay on track with your fitness goals and live a healthy, balanced life. GoBe 2 has a lithium-ion polymer battery. A full charge can last up to two full days of average use. Syncing your device more often can drain the battery life. For optimal battery life, sync your device with the GoBe app 3-5 times daily. Only charge GoBe 2 using the Healbe charging dock and cable sold with the device. To optimize performance, be sure to download the latest software to your GoBe 2 device. Android devices running Android 4.3 and above. Each time you turn on your GoBe 2 device, you will be prompted with a SYNC message reminding you to pair it with your smartphone via the GoBe app using a built-in Bluetooth connection. If the device is not synced with the app, it will automatically turn off after 5 minutes. When the device is off, it WILL NOT record any data. The device must be powered on to record metrics. It can take up to2 minutes for the GoBe 2 sensors to connect with your body. Applying a little moisture to the skin on your wrist under the sensor will help the device to connect more easily. If GoBe 2 does not connect within 5 minutes, it will notify you with a vibration and will power off after 5 additional minutes if it cannot connect. The GoBe 2 battery can last up to 2 days, depending on how often you sync it with the GoBe app. For optimal battery life, sync your device no more than 3-5 times per day. Before placing the bracelet on the charging dock make sure that the pins on the bracelet are clean and dry. Insert GoBe 2 into the charging dock. Make sure to line up the metal pins on the charging dock with GoBe 2’s bronze-colored pinholes adjacent to the sensors. Plug the USB-C end into the side of the GoBe 2 charging doc and the USB into an appropriate computer port or wall adapter. When the charging dock is aligned properly and the power cord is plugged in, the light on the back of the charging dock will turn red. When the battery is full, the light on the charging dock will turn blue. Use proper USB cable for charging. Prevent shock to the device (i.e., dropping, banging); it can damage the battery and impair performance significantly. When charging, use a power source that produces a voltage of at least 4.8 volts and a current of at least 700 mA. Avoid letting the battery life fall below 10% before charging. Do not store Healbe at 0% power. Do not expose GoBe 2 to temperatures above 60 degrees Celsius/140 degrees Fahrenheit. Do not store or operate the device at temperatures below 0 degrees Celsius/32 degrees Fahrenheit. Charge the battery up to at least 70%. Once a month, drain the battery entirely and immediately recharge to 100%. Turn on Bluetooth via the settings menu on your mobile device. Make sure that your phone has the geolocation function turned on in order to synchronize the GoBe to the app. Hold down the button on your GoBe 2 for 3 seconds to turn the device on. Hold your GoBe 2 close to the device you are pairing it with. Open the HEALBE GoBe app and log in. The app will search for Bluetooth devices. Choose Healbe GoBe 2 from the list. GoBe 2 uses PIN-code authorization to secure your data. When you pair your GoBe 2 with your device for the first time, you will be prompted to set a six-digit PIN code. You can change your PIN at any time by clicking the wristband icon in the top right-hand corner of the GoBe app. 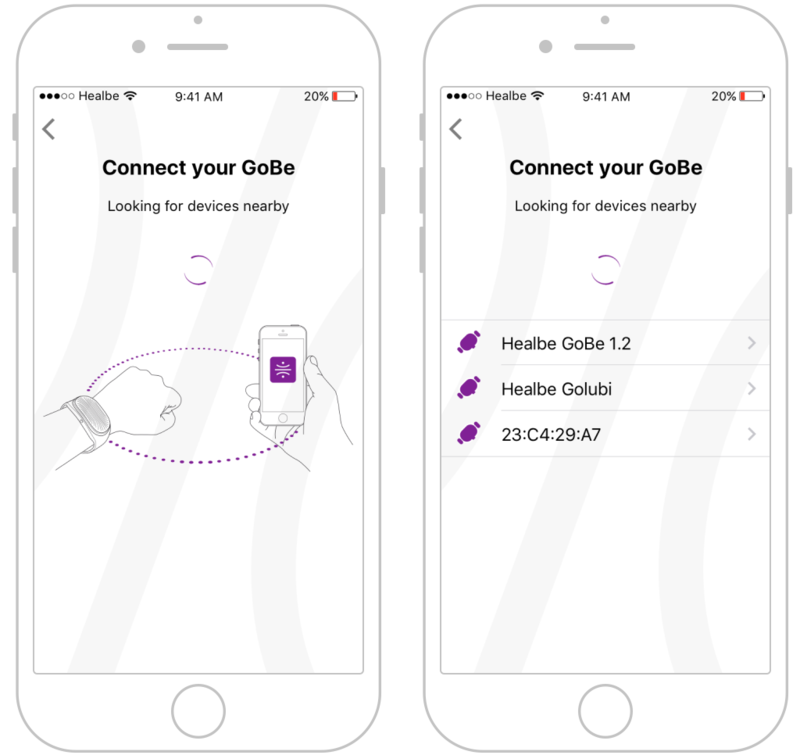 When there is a firmware update available, the GoBe app will prompt you to download. Hold your GoBe 2 close to the device you are updating. Log in to the GoBe app and connect to your device. Click the wristband icon in the top right-hand corner of the home screen. Place the GoBe 2 on its charging dock, plugged in. Wait for the firmware update to be installed. Your GoBe 2 will then be ready to wear and use. IMPORTANT: Updating the firmware will erase any data GoBe 2 recorded for the day, so begin the installation first thing in the morning or after syncing the device with the app. GoBe 2 should fit snugly on your wrist with the wristband’s sensors completely flat against your skin. Proper fit is key for the sensors to perform properly and accurately track your body metrics. 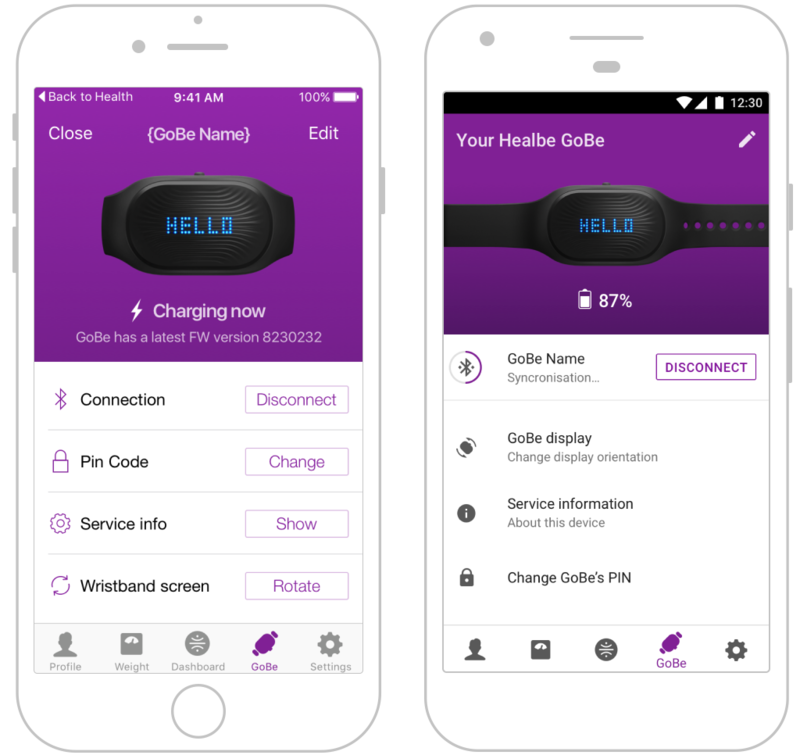 GoBe 2 will notify you when it is not in contact with your skin by displaying the “no contact” icon and vibrating once every 15 seconds until you tighten the wristband or adjust the placement of the sensors. If contact is not restored, GoBe 2 will turn off automatically in 5 minutes. GoBe 2 can only be worn on your wrist. The accuracy of the data improves the more often you wear the device. It’s recommended to wear GoBe 2 constantly, except to charge, for the most accurate information. Wear the device on smooth, unaltered skin. Wearing the device on a wrist with tattoos, scars, abrasions, inflammation, or other atypical skin conditions may affect the accuracy of the readings. Do not use moisturizing creams or cosmetics on the skin under the sensor immediately before putting on your GoBe 2. For information about GoBe 2’s materials and potential allergic reactions, please see the “Materials, Contraindications & Allergies” section below. What is GoBe 2 telling you? Please note: If you need to update the email address associated with the account or wish to give your device to someone else to use, you must create a second account. After creating a new account, all new data will be linked to your new account. Data from the previous period will remain accessible in the online Healbe web portal using your first account. 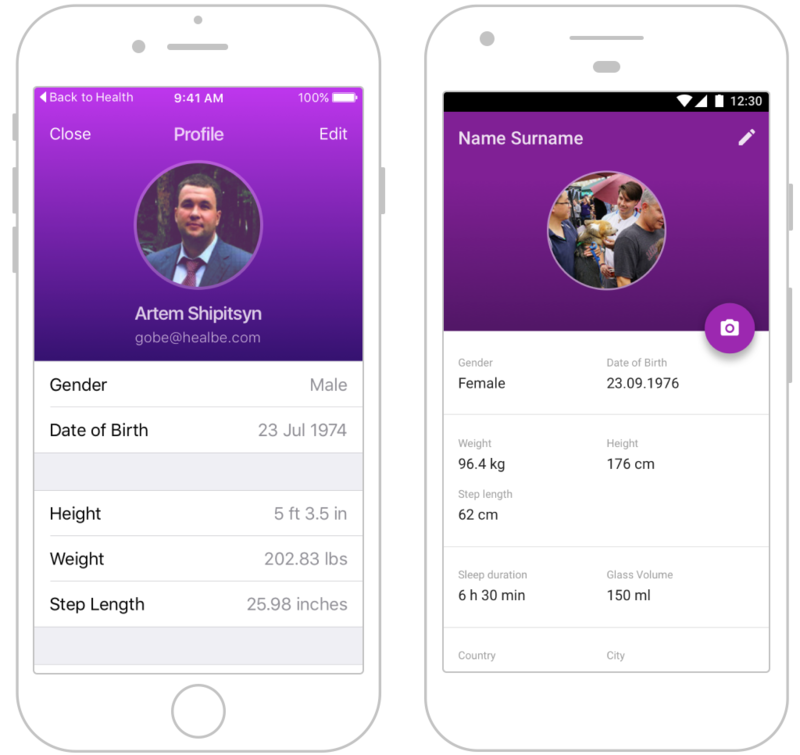 Your profile information is key for GoBe 2 to collect the most accurate information about your body. Each field will provide tips to help you complete your profile. Step length –Distance from toe to toe when you are walking at a normal pace. The default is an estimate based on inputted height. For calibration and greater accuracy, measure the distance you cover in 10 strides and divide it by 10. Resting heart rate – To calculate, remain inactive for at least 10 minutes. Take your pulse for 15 seconds and multiply by 4. This gives you your heart rate in beats per minute or BPM. This shows your units of measurement selections within the app. You can edit these preferences at any time. 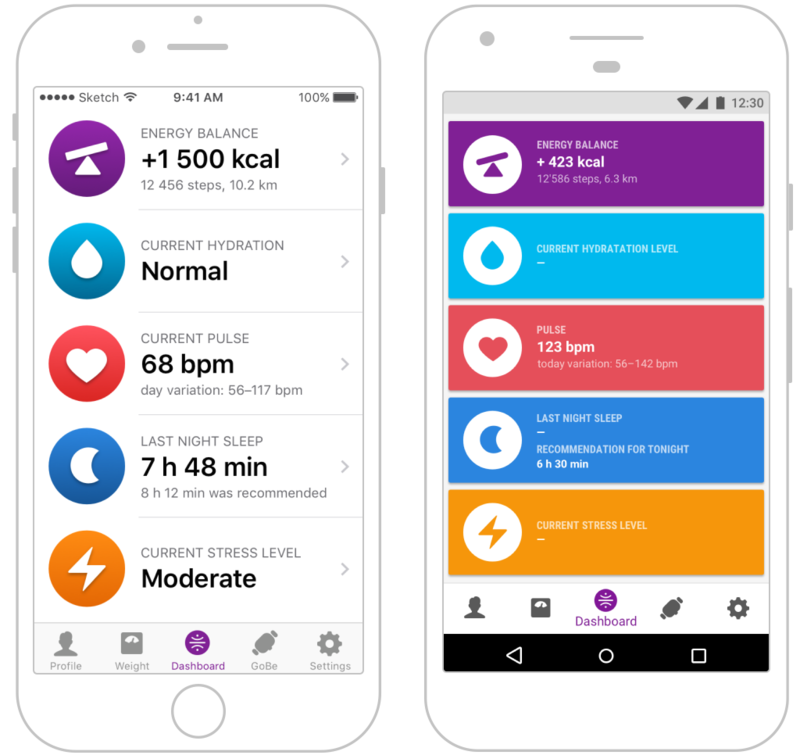 This is the main screen of the app, which displays all health metrics up to the last time you synced your GoBe 2 with the app. For more detailed information about each parameter, click the parameter of interest. All data history can be accessed via the online dashboard as well. GoBe 2 automatically tracks calorie intake without manual logging, error-prone guesswork or reading nutrition labels. Our most recent algorithms no longer require you to push a button to indicate the start of a meal. Calorie intake measurement is reflected hourly in the GoBe app and online dashboard. 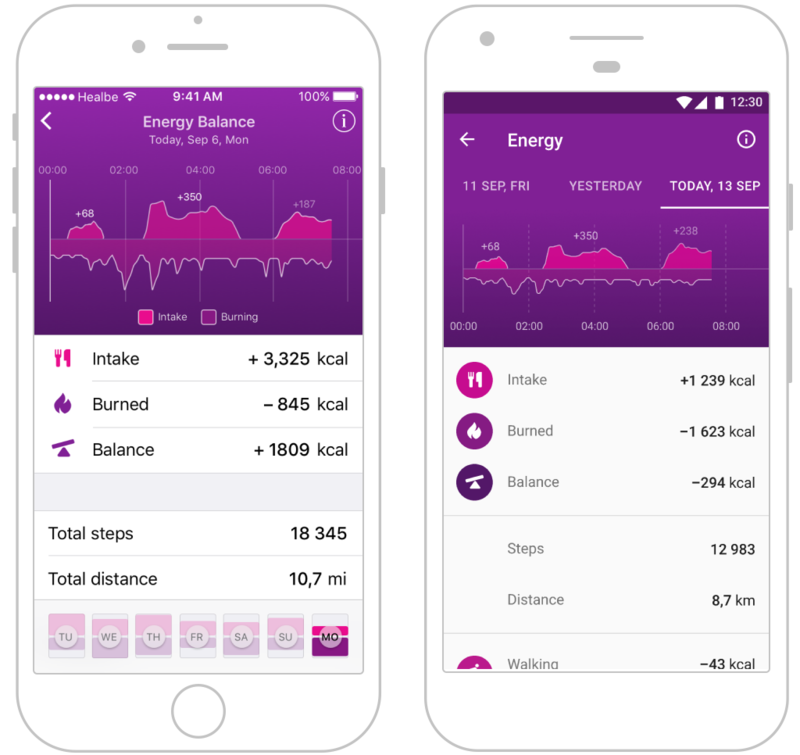 Calories from digested food are immediately, and automatically, logged in the circle at the top left of the Energy Balance screen in the app. The difference between calories consumed and calories burned displayed as a whole number at the top of the page reflecting the metrics plotted on the graph. Calories consumed above the x-axis and calories burned below the x-axis. Swipe the graph to see data from a different time of day. Swipe the table to see data from a previous day. The graph shows nutrients that have been absorbed by your body from food and nutrients that are mobilized directly from the resources of the body (glycogen, fat). GoBe 2 does not detect calorie intake instantaneously because the food needs to begin the digestion process before it is detected by the band. Depending on the food you eat, this process can take anywhere between 20 min. and eight hours. How does GoBe 2 measure calories burned? 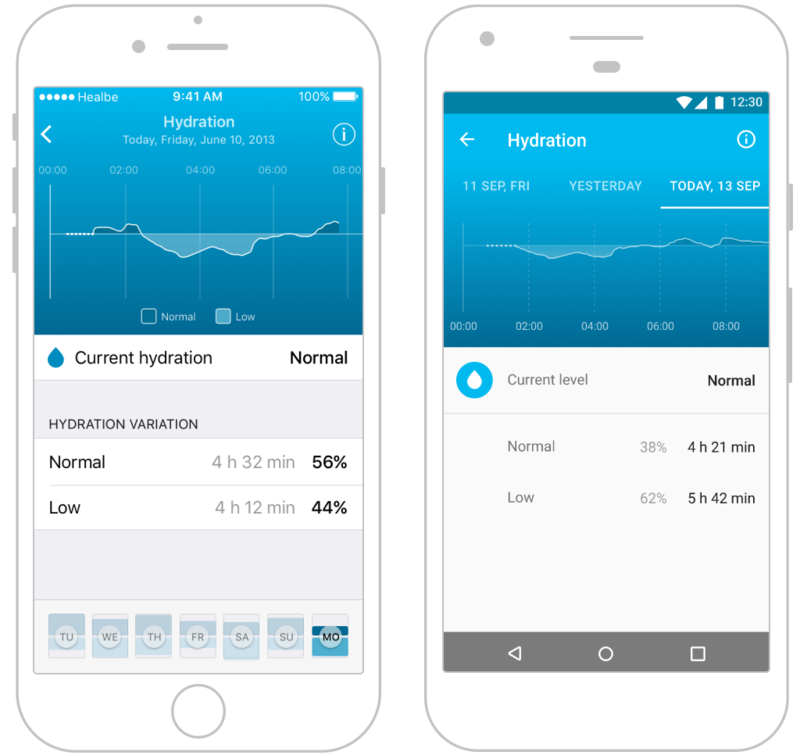 GoBe 2 learns your body’s normal water balance (a process that can take up to two days) and automatically monitors your hydration levels thereafter to let you know when you need to rehydrate. For GoBe 2 to accurately determine your normal hydration levels, it’s important to wear the wristband constantly for the first two days (except to charge, if necessary). You have the option to select the time interval during which GoBe 2 will alert you to DRINK within the app. This ensures the device will not interrupt you. 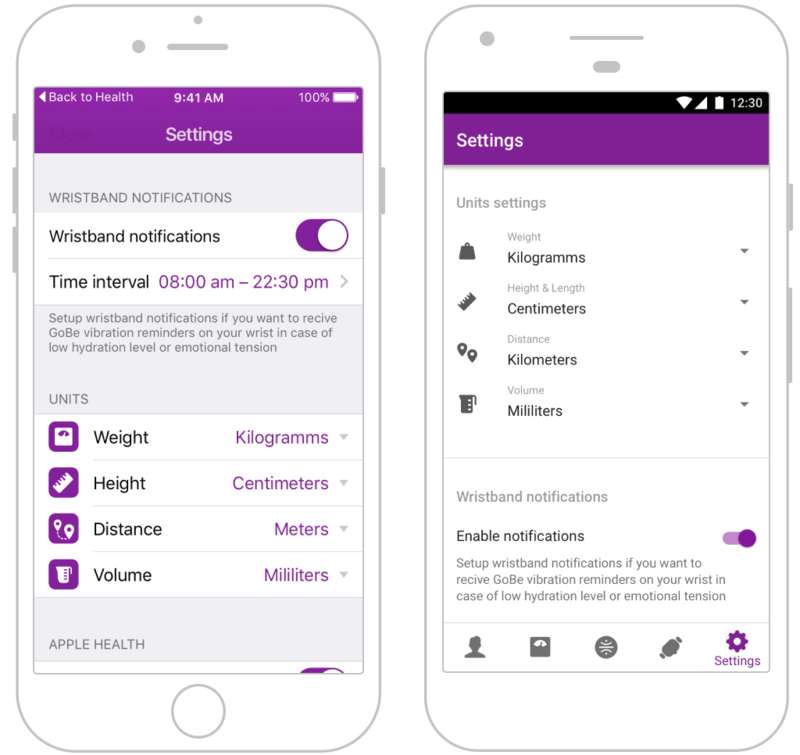 Notifications are switched off between the hours of 9.00 pm and 8.00 am by default. If your body’s hydration level is low, the screen will read LOW. After drinking enough water, GoBe 2 will indicate you have returned to a normal state of hydration (NORM). When your GoBe 2 vibrates and displays DRINK, drink at least 200 ml/8 fl. oz. of water . Mineral water provides the most efficient means of hydration. If GoBe 2 vibrates again reminding you to DRINK, your hydration level is still LOW and you need to continue drinking water to restore your normal hydration level. Food with high water content takes longer to register than drinking a glass of water, so GoBe 2 may still alert you to DRINK shortly after consuming these foods. Swipe the chart on this screen to see data from another day. How does GoBe measure hydration level? Your heart rate is constantly monitored by your GoBe 2 device. 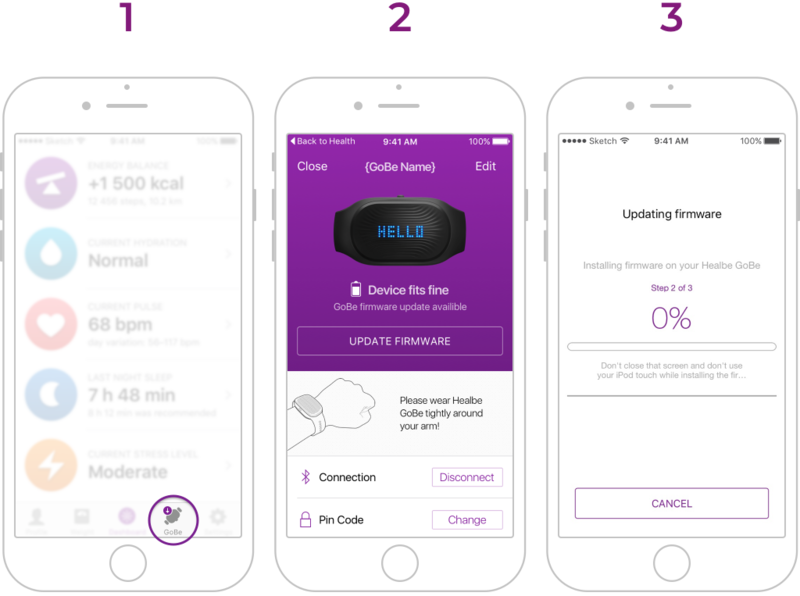 GoBe 2 measures and update your heart rate every 5 seconds to help you see how you perform everyday tasks and how you can maximize your workout. When GoBe 2 is on your wrist and synced with the app, your average heart rate over the last 5 seconds will appear at the top of the screen. An overview of your average heart rate over five-minute intervals is displayed on the graph in the GoBe app. How does GoBe 2 measure heart rate? Track the duration and quality of your sleep each night. Provide comprehensive graphics in the GoBe app and web portal to show when you’re sleeping and your level of anxiety at different points throughout the night. The graph also shows REM and NREM phases and periods during the night when you were awake. Wake you up feeling refreshed by syncing your target wake up time with the end of the REM phase closest to that time (the end of a REM phase is the optimal time to wake up feeling energized). GoBe 2 tracks involuntary behavior throughout the night by monitoring physical activity and changes in heart rate. 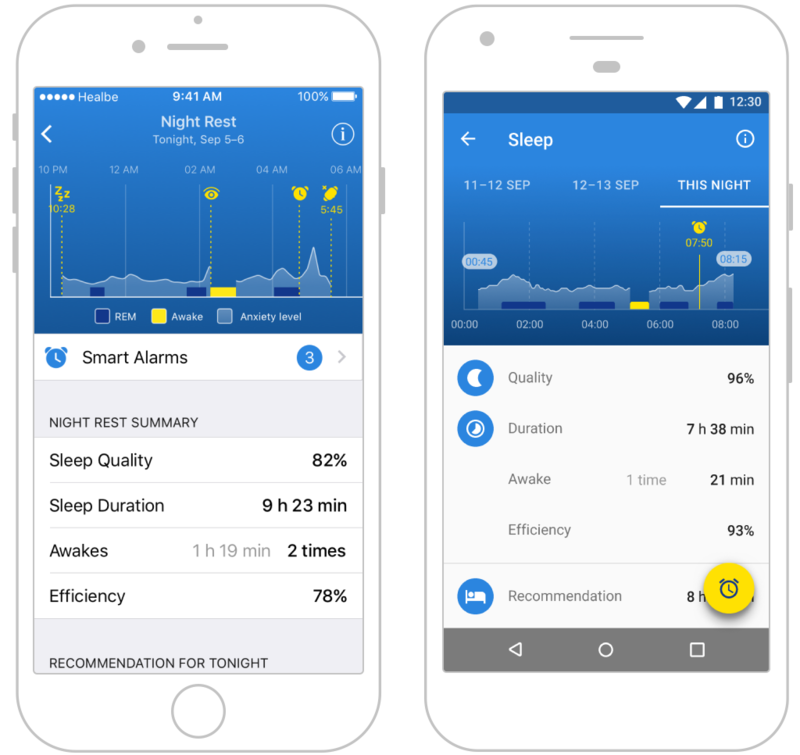 The graphic in the sleep menu on the GoBe app is generated by tracking the intensity of involuntary activity/movement during the night and heart rate changes, and the times at which they occurred. It shows anxiety levels, time awake and REM phases of sleep. Important: GoBe 2’s algorithms are programmed to only monitor sleep between the hours of 9 p.m. and 12 p.m. the next day. How does GoBe track sleep? 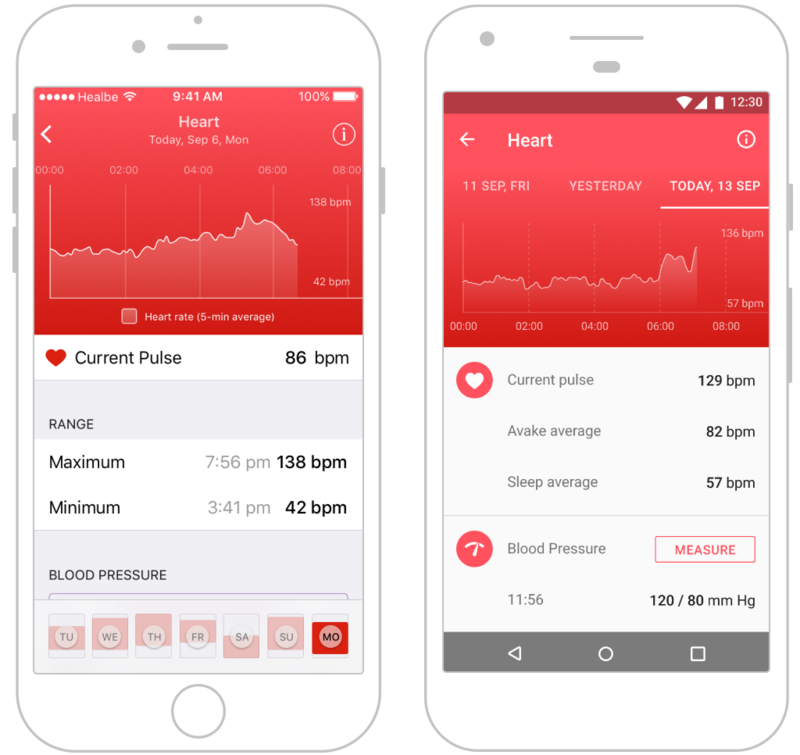 GoBe 2 estimates stress level based on heart rate metrics and activity level, in addition to other personal health data from the app and sleep quality metrics from the previous night. GoBe 2 recognizes physiological stress indicators, such as body temperature and perspiration, and makes you aware of times when you may be experiencing a heightened emotional state. GoBe 2 will notify you when it detects physiological shifts signifying strong emotions by vibrating and displaying EMOTION. the case of strong emotions (love, anger, fear, happiness, etc.) with vibration and the EMOTION message on the display of your GoBe 2. 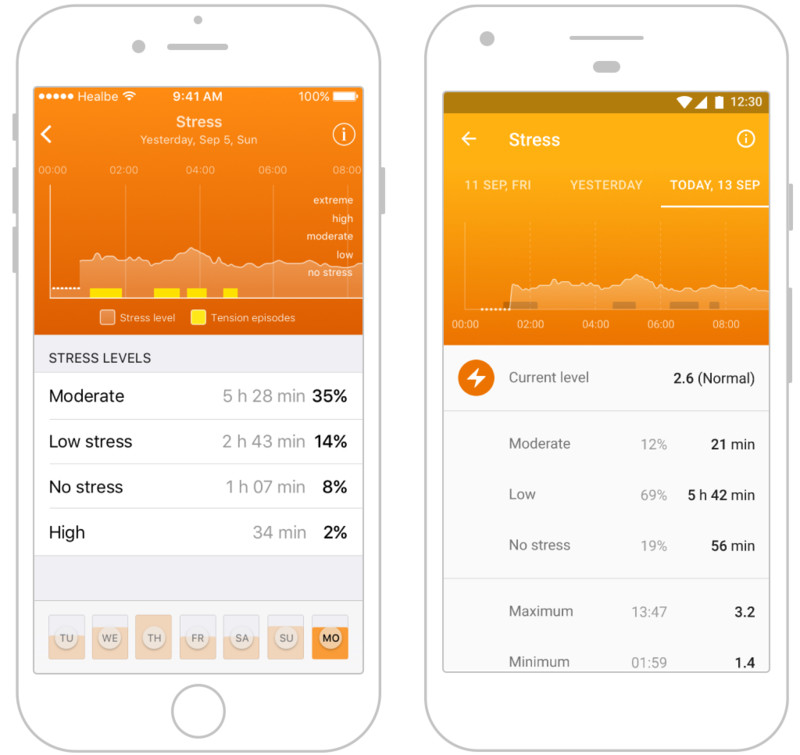 How does GoBe 2 measure your stress level? Toggle “Sync my Healbe profile” and “Export GoBe data”. The “Health Access” page will appear automatically. Toggle the switches on to allow the GoBe app to access data related to calorie intake, heart rate and sleep in Apple Health. Tap “Sources” in the bottom menu, and select the Healbe GoBe app. Toggle the switches on to allow Healbe GoBe app to access data related to calorie intake, heart rate and sleep data from Apple Health. 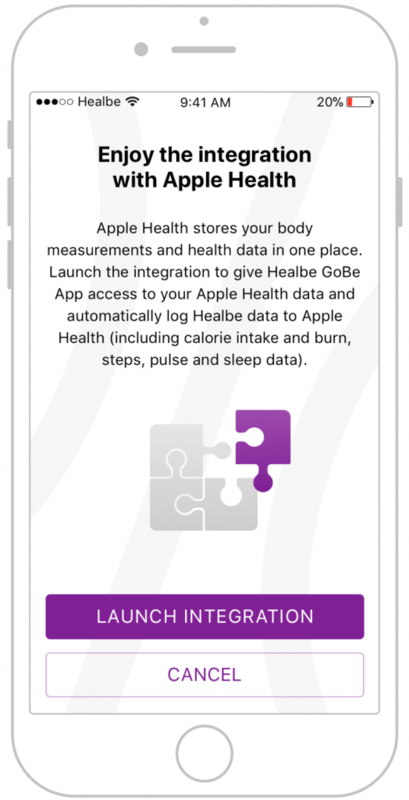 Note that the data displayed in the GoBe app will start from the time you enable access to Apple Health and will not include historical data. Use your GoBe 2 daily and monitor your data on the Apple Health Dashboard. Scroll down to fields “Sync my Healbe profile” and “Export GoBe data” and toggle the switches off. 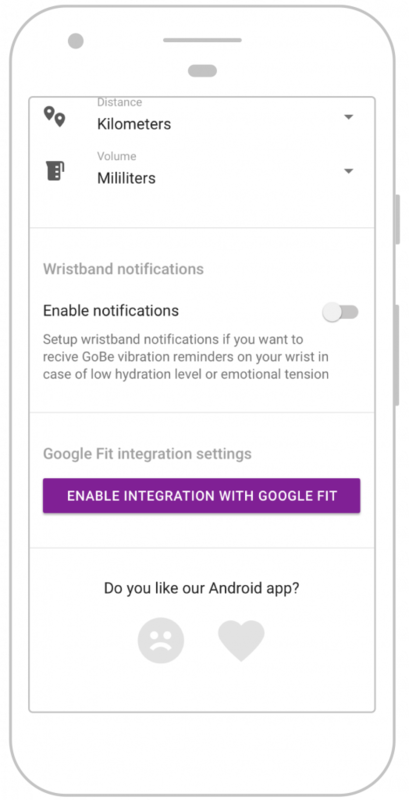 For a complete picture of your health and fitness data, integrate your GoBe 2 device with Google Fit. Your calorie intake, heart rate and sleep data will be updated and displayed in the Google Fit platform. 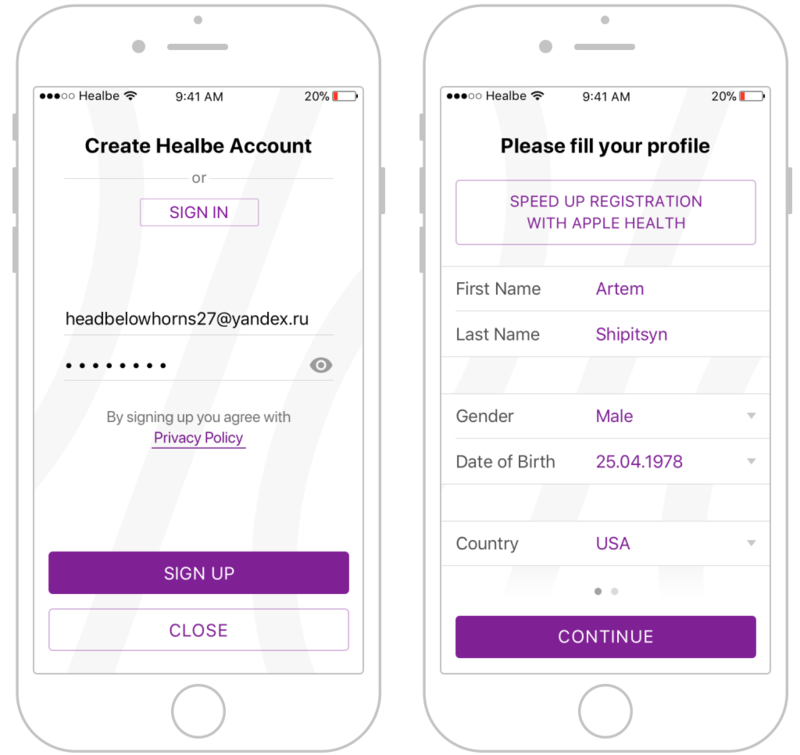 The data displayed in Healbe GoBe app will start from the time you enable access to Google Fit and will not include historical data. 2.Click Setup on your inKin dashboard page (OR simply visit the device page on your live feed). 3.Find the Healbe logo and click Connect. 4.Enter your Healbe email address and password and click confirm. Syncing Healbe with Withings Smart Scale. Integrate GoBe 2 with your smart scale to get more detailed health information and a thorough analysis of your progress towards your weight goals. Check to make sure both devices are synced and working properly, and ensure you can see data in web accounts for each device. A window will pop up. Click Integration. 4. A window will pop up. Click Integration. The previous step will bring you to Withings’ website. Login to your Withings account (see screenshots below for reference). You must register as a GoBe user in the app before you can access the online dashboard. Access all GoBe 2 data securely online at www.healbe.com. The dashboard is linked to the same email and password used in the GoBe app. After logging in to your account online, you can view all metrics collected by your GoBe 2 device and synced with the application in the online web portal. Information that has not yet been synced to the GoBe app will not be displayed. Do not use GoBe 2 in salt water or chlorinated water – it will damage the unit’s casing. If the casing gets wet, wipe it dry to prevent water marks. Clean the casing, using a microfiber cloth (slightly damp with water, if needed) in all areas EXCEPT where the sensors are located. If you do not have a microfiber cloth, you can use any material that will not leave streaks or damage the casing. To clean the sensor, use only a cloth slightly damp with water, or hygienic non-alcohol-based wipes. Clean the sensors a few times per week and immediately following any physical activity to prevent damage to the sensors. Clean your GoBe 2 after any rigorous physical activity, or any activity during which you sweat. Clean the charging contacts once per week using a clean cotton swab. Please note that while the Healbe GoBe 2 is designed to provide you with information about the conditions and trends in the physical state of your body, Healbe GoBe 2 is not meant to be used as a medical device and should not be used to diagnose, treat, cure, or prevent any disease; also note that it should not be used as a substitution for expert medical advice. Healbe GoBe 2 measures the basic characteristics of your body using unique technology and algorithms to provide you with accurate data (including consumed and burned calories, step count and distance walked, energy balance, sleep quality, stress level, and heart-rate), but the accuracy of the GoBe 2’s readings depends on the accuracy of the personal data you put in your profile and whether or not you are using the GoBe 2 correctly. The GoBe 2 requires the device’s sensor to be situated in close contact with the user’s skin by tightening the device’s band. A small percentage of users have experienced minor skin irritation in the area in direct contact with the device’s band. If you experience symptoms such as redness or swelling on your wrist, immediately discontinue wearing the GoBe 2, wash the affected skin area with soap and water and clean your device according to the sensor and casing maintenance instructions above Symptoms should subside within 1-2 days. Maintaining your device according to the user manual (https://wp.healbe.com/us/faq/228) will minimize such risks. Darkening and/or other minor changes in GoBe2 back plate appearance is a process which is caused by golden plating’s wear and tear as it reacts to user’s sweat complexion. This process doesn’t affect the bracelet functionality, is safe for user’s skin and is not a warranty case. Wristband – TPSIV (Thermoplastic polyurethane and crosslinked silicone rubber) with an aluminum buckle. Do not use the GoBe 2 if you are allergic to any of materials mentioned above. Acute illnesses that raise body temperature above 37° C (98.6° F). Conditions varying significantly from physiological norms. For example, a sleepless night, jet lag, or high emotional tension can heavily impact how your body digests food, so the device’s calculation of calories consumed and burned can change significantly.